The experience of the peaceful revolution in 1989 gave many people the hope that a society without violence, a Germany without a military and a world without wars could become possible. These goals led 1990 in Halle people from various citizens' initiatives together to form a circle of peace and were the basis for the association founded in 1991. Our commitment today in peace policy, peacebuilding and peace services is determined by a dynamic understanding of peace: we do not see peace as a condition, not as a distant goal and not only as the absence of war. Peace is for us a way to a partnership, just and non-violent coexistence in diversity, which enables the development and freedom of the individual. The basic themes and guiding principles of our work are nonviolence, constructive and civil conflict transformation, living democracy, transcultural diversity and global justice. 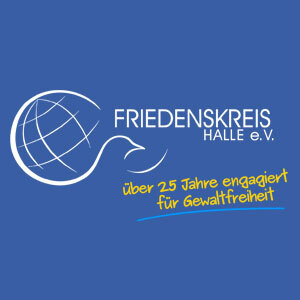 The Friedenskreis Halle (Halle Peace Circle) has been offering international volunteer services for more than 15 years. We want to give people the chance to get involved in a fair world, to show solidarity with other people from other living worlds, to try for themselves, but also to question and grow in their own embedding in global structures. Albania, Bosnia-Herzegovina, Kosovo, Macedonia, Serbia, Rwanda, Spain.